Tis The Season To Be Merry...Imagine the look on your friends faces as they see you drinking from a moose mug! A&R Collectibles is pleased to offer our "Christmas Moose Mug". 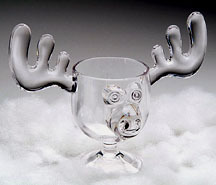 We have done our best to produce these high quality ONE PIECE Custom Made Acrylic Moose Mugs. Made of FDA approved break-resistant lightweight BPA free crystal clear acrylic which is superior to plastic with the added benefits of being a stronger and safer alternative to glass. Size: Width 8.25" (from antler tip to antler tip, Front to Back 4.25" (includes snout), Height: 6.25". Holds 8 oz. of your favorite beverage...eggnog of course!! Dishwasher safe and individually packaged in a holiday gift box. (Note: Dishwasher safe top rack only. Hand wash recommended). These are the ONLY ONE PIECE moose mugs on the market with 8 ounce capacity. All others have glued on antler ears and are much smaller in size and capacity.